Infant Program | Kindertots Children Centre Inc. In this program we have children ages newborn to 15 months old. The group size is a maximum of 9 infants to 3 staff. In this group, where the children are under 15 months we require the parent to provide us with a specific written schedule of their child’s day, including feeding and sleeping times and specifics of how food is prepared etc. The children in this group do many activities including Sensory, Language, Gross Motor, Outdoor time and Exploration of the world around them. You may walk in the room at any time and see the Infants be creative with pudding, painting a picture or building a hill, you might see them splashing in colored water to see if they can create new colors. 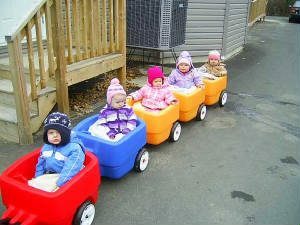 They take our “Choo Choo Train” for walks around our quiet neighborhood all while interacting with Infants their own age and Early Childhood Educators. All activities are done while still respecting their individual schedules. Communication Charts are sent home everyday with each child. The charts are a form of communication that compliments the Educator ~ Parent interaction. We encourage all parents to look at their child’s Activity Binder for the Curriculum so they can see how they are progressing in their development.